As dog parents, chances are good we love dogs so much in part because of their exuberance and enthusiasm for life. A great way to reward our dogs for the joy they bring to our lives is to get them outdoor dog kennels. 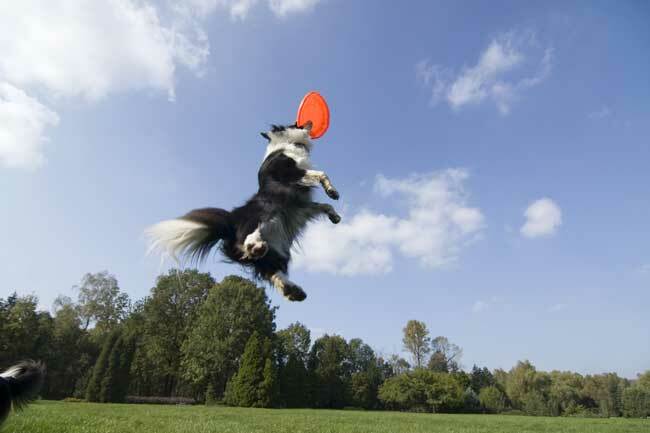 It is so much fun to watch our dog run, jump, play and enjoy being a dog. And it is great exercise for us too – when we have the time. But if you are like many dog parents today, some days you don’t have time to do more than take your dog for a cursory “do your business” walk twice a day. Because of this, your energetic, exuberant dog sits indoors all day while you are at work or out doing errands for your family. This precise scenario is where outdoor dog kennels and runs can come in so handy. With a large outdoor dog kennel, your dog can get fresh air and exercise whether or not you are home. Let’s talk about finding the right kennel for your dog. If you are looking for an indoor dog cage, take a look at our Dog Crate Guide. 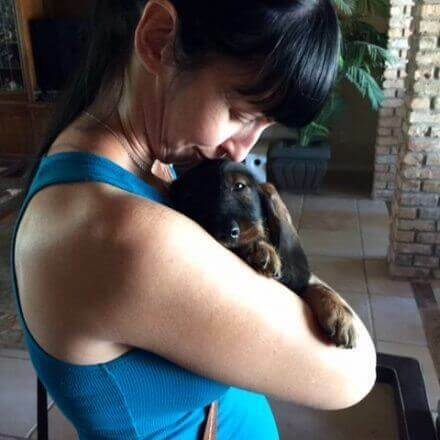 At Animal Hub, we love our dogs and we take their needs very seriously. Crates, cages and kennels can be one of the most significant investments you make into your dog’s daily quality of life. We tell you about the products we use with our own dogs. Advantek thought through the design on this kennel. Awesome choice for your dog. We like the Advantek Pet Gazebo and it shouldn’t be hard to see why. They put some thought into the design here and we always appreciate anything that is made with dogs in mind. 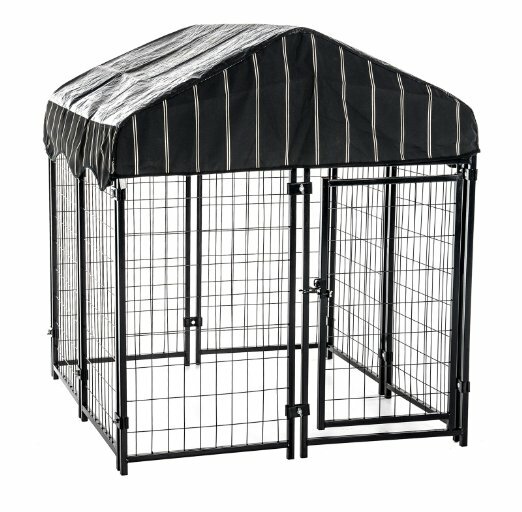 You can’t predict the weather, which makes this outdoor dog kennel a great choice. Advantek used a low profile design that provides outstanding shielding from the elements for your dog. When you are headed off to work and it looks like it could rain, this pen is nice because your dog is covered from getting absolutely soaked. At 60 x 60 x 60 inches and the reversible polyurethane cover included, the Advantek outdoor kennel is particularly nice because there are no tools required for setup. Your dog is a digging addict? And Their Safety Is Critical. You know your dog better than anyone. So it can be a really great idea to sit down and think through your dog’s personality, typical behavior and unique talents when shopping for an ideal outdoor kennel. You definitely want your dog and landscaping to play nice together. 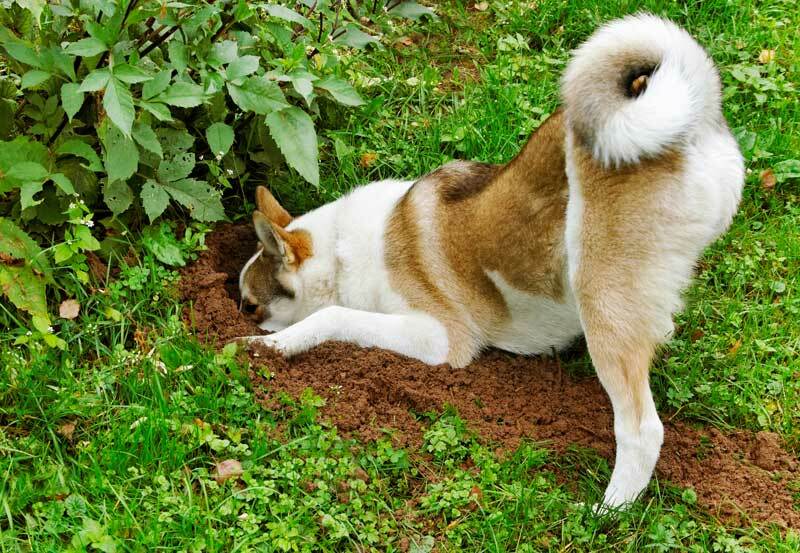 Is Your Dog All About Digging? For incurable diggers and burrowers, you will want to invest in a kennel that can sit nicely on concrete. This is the only sure way to keep your dog from finagling a way out of the kennel. A second option that can work for all but the most determined diggers is to simply bury the fence wire or chain link at least one-half to one foot under the dirt. Generally, it is just a lot less work to set up your dog’s outdoor pen on concrete. An Outdoor Dog Run AND Be Super Comfortable? still give him comfort fit for the leader of the pack! double door modular outdoor kennel. A big concern among dog owners, and rightfully so, is the health risks of having your dog lay on concrete all day. Nobody wants to think about their dog having to lay on concrete all day. No dog owner wants to see their dog begin to develop calluses on their elbows or hips because of laying on concrete all day. The problem is, if you put a “typical” dog bed with stuffing into the dog run, you know that your dog might chew it up. The last thing you want to do is a trip to the vet to remove stuffing. 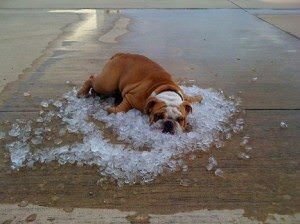 Luckily, we have a fantastic solution for a nice, cool spot to lay that is also a great orthopedic for your dog. favorite products made for dogs. among us, we own 9 Kuranda beds. The vinyl fabric is woven and because of this, it allows water and air to pass through the fabric. We like that it doesn’t hold water and begin to have that musty dog smell. They are super easy to clean and Kuranda actually guarantees that they will stand up to repeated cleanings. 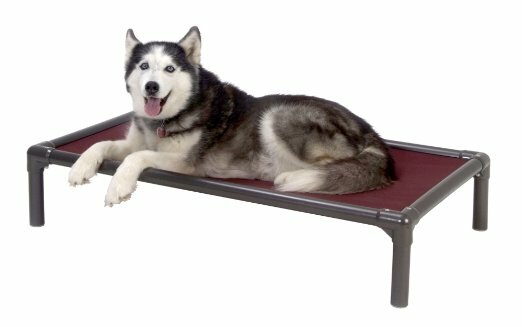 For Kuranda’s aluminum dog bed, they weren’t joking around and designed this raised bed with lightweight aircraft grade aluminum. If your dog loves to jump and climb (and could give an Olympic hurdler a run for their medal) you will want to select an outdoor cage with an extra-high fence. You may want to actually measure how high your dog can jump to be sure the kennel fence is high enough. Selecting a kennel with an enclosed top can also easily solve this problem. Here as well, installing a very high fence on your first go will discourage your dog from further attempts to jump over it (whereas having to upgrade after your pooch easily masters the first, second and third fence heights is actually teaching her to jump ever higher). Are there parts of your yard that tend to flood or get fried by the sun? The proper placement of your outdoor dog run will be key to keeping your dog comfortable and safe during outdoor time. You always want to choose a place with at least partial guaranteed shade (and full guaranteed shade for especially sun and heat-sensitive breeds such as Great Danes). All dog owners should understand how to prevent heatstroke in their dog. Also, try to avoid placing your dog’s outdoor kennel over low-lying areas that are slow to dry out after a storm – perpetually soggy ground may make for uncomfortable flooring for your dog. Finally, be sure you don’t include anything near the kennel that your dog could use as a handy escape aid, such as old tree stumps, storage boxes, raised garden beds, bushes and the like. In most cases, you will want to locate your dog’s new outdoor kennel sufficiently far from the house to avoid the scent of dog pee and poop when the wind is blowing towards your home. Also, this will minimize noise pollution if your dog decides to go on a sudden barking spree. You should also consider which end to place where. The door of your new kennel is likely either on one end or on the side. 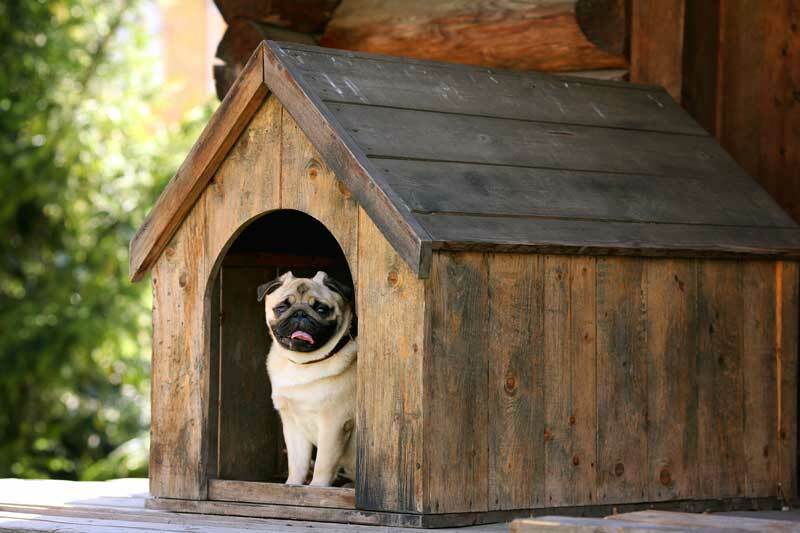 If possible, placing the door end as close to the doghouse shelter (where you will probably want a raised dog bed, food and water) will encourage your dog to do his business at the opposite end (which you have hopefully also placed furthest from your own house). Also, using a raised platform that is slightly sloping will help keep runoff from rain and cleaning water from pooling inside the kennel, which can attract unwelcome predators and breeding insects. Some outdoor dog runs offer better two-way visibility than others. If your dog is quick to bark at passersby or other stimuli, you may find your own sanity (not to mention your relations with your neighbors) benefits greatly from choosing a run with less overall visibility. As well, this can keep your dog from becoming too over-stimulated from barrier frustration, which can lead to chronic anxiety or aggression. Barrier frustration is an important thing to keep in mind. It can happen in any type of enclosure, from a small portable carrier to a permanent spacious outdoor dog kennel. 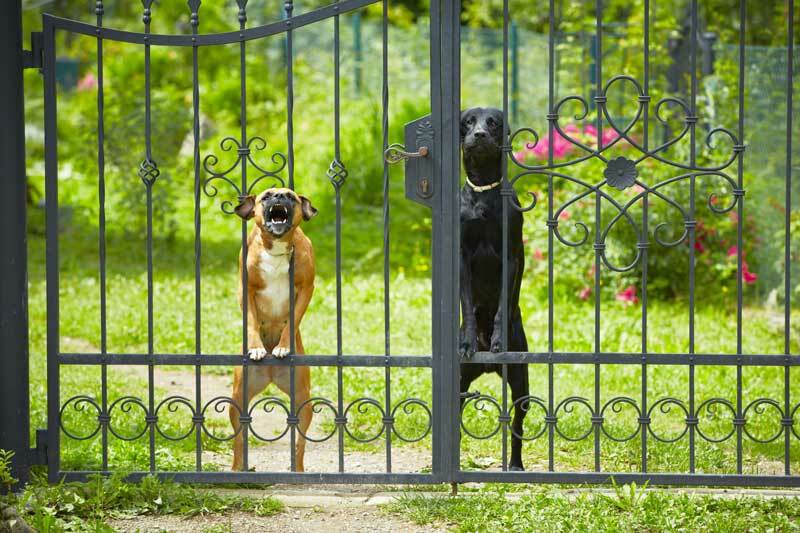 Barrier frustration occurs when your dog is unable to see or interact with what is on the other side of the fence. Frustration can arise from boredom, teasing from passersby, inability to see through the barrier, loneliness and many other issues. The best way to reduce the threat of barrier frustration, which can lead to serious stress, aggression and anxiety (as well as the possibility of putting your neighbors over the edge) is to select a barrier where visibility is higher and also limit outdoor kennel time until you see how your pup responds to the presence of the barrier and different unseen stimuli. It goes without saying that if your dog needs a heavy-duty dog crate inside the house, you will want to opt for a more durable outdoor run, such as wire or aluminum. Finally, if you live in an area that is more rural, is near a bayou or waterway or simply has more native wandering wildlife (coyotes, snakes, bats, skunks, opossums, raccoons, eagles, hawks, spiders, et al), you will want to be sure the outdoor enclosure you choose does not trap your dog in with a potential predator or expose your pup to diseases presented by wildlife. An enclosure with more solid walls plus the addition of an enclosed floor and covered ceiling is the only reliable way to increase your dog’s safety while outdoors in less-safe rural spaces. in a new dog run for your backyard. As with indoor cages, crates and dog kennels, outdoor runs come in many different types of materials. The most common materials include wood, wire, plastic and canvas/nylon. Sometimes a run will incorporate more than one material, such as a kennel that features wire sides with a canvas top and roll-down canvas side options. Your outdoor climate can also help you decide which material will offer the greatest stability and durability. Metal outdoor kennels are most likely to remain durable for a long time, although rust is always a potential issue. Wood kennels can warp, rot or degrade more quickly than other outdoor kennels over time – this is particularly the case in humid, warm climates, because of the effects of humidity on wood. safe while you are at work. Should you go with a permanent or portable outdoor dog kennel? We can get that figured out. An outdoor dog run can be a significant investment, so you will want to carefully consider how you would like to use it before you plunk down any cash. There are two basic kinds of outdoor kennels: portable and permanent. 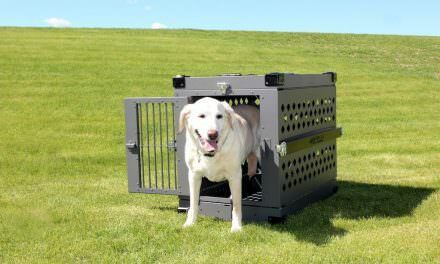 A portable kennel has several interlocking panels that can be folded down flat for travel. If you like to take your dog with you on weekend getaways, beach visits and park fun days, a portable kennel might be what you want. Some portable outdoor kennels contain side panels only. 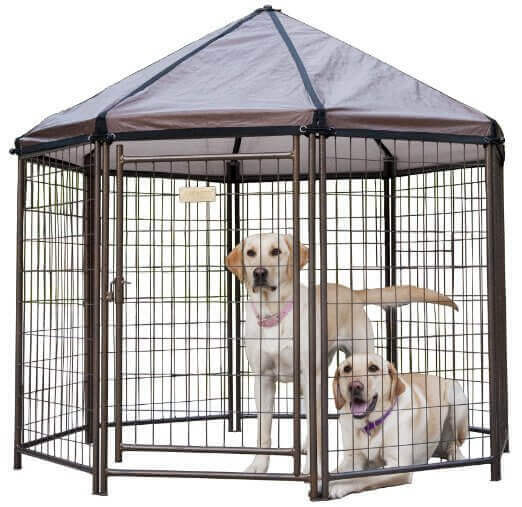 Other kennels also include a top and bottom, but these are made of lightweight canvas or nylon material that can fold down easily for packing and travel. A permanent kennel, on the other hand, typically requires some actual planning and construction to set up in your home space. For example, you may need to lay a concrete slab and add gravel or dirt for flooring. If you want it to be really secure, you may also want to sink the walls 6 to 12 inches underneath the ground for added protection against predators. You could also add an outdoor dog house to your permanent outdoor dog run since it offers shade and shelter and can double as permanent outdoor housing in temperate weather. Certain states have statutes about outdoor dog kennels. You should definitely look to see if your state does. If you are considering housing your dog outdoors on a more permanent basis, it can be worthwhile to research your state’s statutes (if any) regarding requirements for outdoor dog shelters. Some states (Minnesota is a great example) have rather lengthy and detailed statutes regarding the kind of shelter that must be provided for any dog housed permanently outdoors. The statutes like this one the SPCA talks about may be listed under shelter, tethering or even animal cruelty (re: if a chain or tether is employed). By researching your state’s requirements in advance, you will be able to pick an outdoor kennel that offers the safest and most secure housing for your dog. We can help you choose easily. can be a really good idea. Unlike with travel crates, where you measure your dog’s full height and length and add 2 inches to each, or home cages, where you do the same and add 6 inches to each, you will want the outdoor kennel you choose for your dog to be as roomy as is reasonable and safe. Of course you want to start with the basics when sizing your dog for an outdoor kennel. 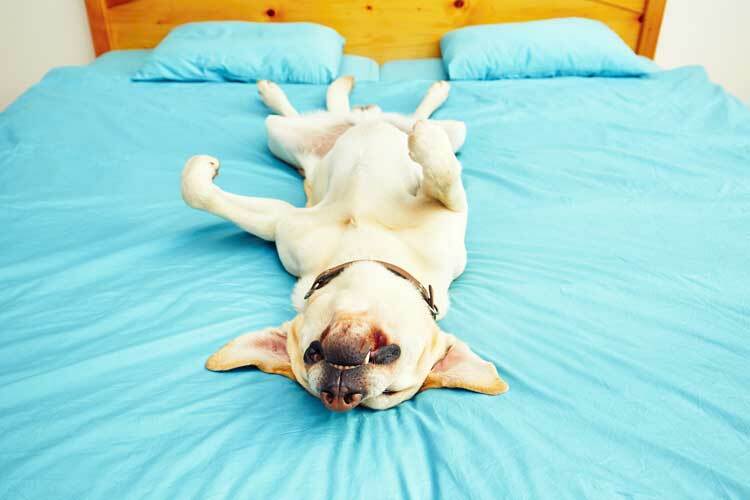 In other words, at a bare minimum, you should make sure your dog can easily stand up, turn around, stretch, lay out flat at full length and roll over without restriction. Beyond these basics, in general even dogs that specialize in the high vault should stay contained within an outdoor kennel with 6-foot high walls. But if your dog is an aspiring canine Olympian, opting for extra-high 7-foot kennel walls may be a smart choice. The size of your dog will also help to inform your choice of outdoor kennel size. Most outdoor dog kennels come in these 2 basic sizes: 10 ft. X 10 ft. and 15 ft. X 5 ft. Many kennels also come with panel add-on options so you can expand the basic kennel dimensions as you wish for more moving and running space. Larger dog breeds that love to run will really appreciate the longer kennel size with add-on panels. And since even outdoor kennels sized for smaller breeds tend to be at least 5 ft. wide, you won’t find too much perplexing variety to choose from here. 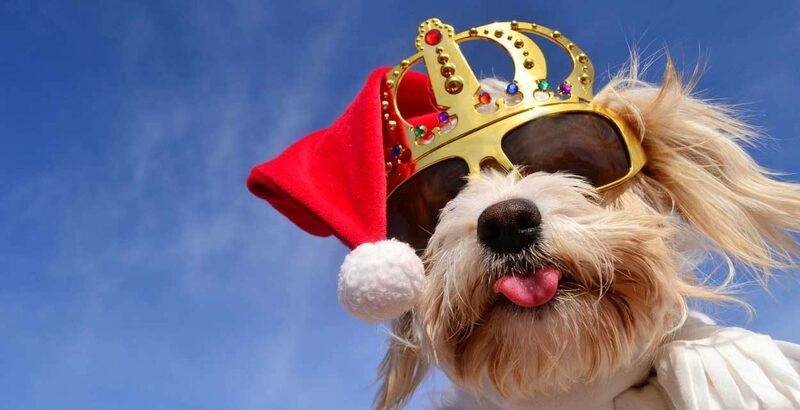 When the average pet store stocks a full variety of puppy totes, bejeweled leashes, canine sunglasses, and pet costumes, it is only natural to assume you will have your pick of outdoor kennel accessories and options. The first item you should include in your dog’s outdoor kennel is not optional at all, and that is plentiful fresh water. Since an outdoor kennel is a place where your dog can run, jump, roll and play to his heart’s content, it is easy to visualize how thirsty all that exertion will make him! A large, heavy water dish or auto-refilling water dish is a great choice here. Like we said earlier, having an orthopedic raised dog bed is a great way to provide some kind of soft resting place. You could also use a dog bed, a dog cot, a plump pillow or couch or a favorite blanket. For safety and health, be sure you place the bedding in a draft-free zone (this may require elevating it off the ground) that is away from the elements. If you plan to use the outdoor kennel for partial or permanent outdoor housing, you will also want to include a feeding station. An auto-refilling food dish or timer-based dish can be a great choice if you are not always home to offer regular feedings. If you want to really understand exactly what your dog should have, you could check out this course on housing dogs that the USDA has for breeders. The area where you place the outdoor kennel will have a great deal to do with what kind, if any, of temperature control for your dog’s run you want to add in. For instance, a fan can add a lovely cooling breeze on hot summer days. In the same way, a mister can provide refreshment when it is hot outside. 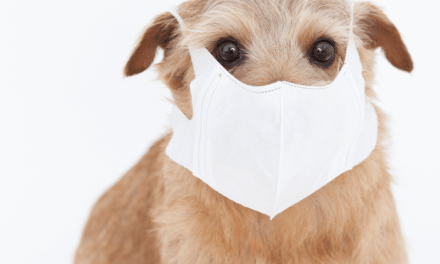 For cooler days, you may want to install a kennel furnace or an outdoor dog warming pad. If you do this, be sure all electrical wires and fixtures are well away from your dog’s reach. NOTE: NEVER house puppies outdoors on a permanent basis. 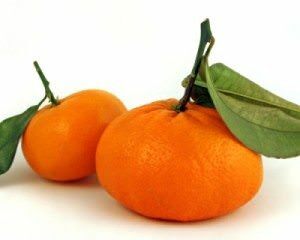 They do not have the ability to warm themselves when they are very young, and their immune systems are not fully developed until they are at least one year old. Since your dog will have learned from an early age not to soil the area where she sleeps, it is important to provide your dog with a dedicated space where she can do her business. This is much more important if you plan to house your dog partially or permanently in her dog run in your backyard. If the kennel is only to be used for exercise and daily play, you may not need to provide this. There are several kinds of artificial turf that can do nicely for a “business” area, and you can add in a marking station that will give your dog the incentive to do her business in that particular area. If your dog will be permitted in the outdoor kennel when no one is home to supervise or at night, there are a number of accessories that are specifically designed to deter predators and pests and ensure your dog’s safety in the outdoor run. Once you have selected a fabulous outdoor dog kennel for your cherished pup, there are still a few steps left. Chances are also good you have been doing your research, which is a good thing and means you are very familiar and comfortable with the presence of an outdoor kennel in your life. But for your dog, the first day you bring home and set up the new kennel will be the first time she has considered the idea. For some laid-back dogs, this is no big deal. You set it up and put them in and they have a great time and that is that. But for most dogs, especially those that are shy or fearful, the presence of anything new is a signal to proceed with caution. This is normal, natural and protective – it is an instinct that is good to see in your dog. Place some of your own clothing or bedding inside (preferably an item you have used heavily and have not washed in some time, so it is full of your scent). Add in a favorite dog toy or item of bedding. “Bait” the outdoor kennel with a delicious treat such as a nut butter-filled toy. Accompany your dog inside the kennel and play with your dog inside for awhile so she sees you feel safe in the kennel. yours, make it super comfortable. After placing your dog inside the outdoor kennel, situate yourself nearby and watch your dog so she feels safe and protected while exploring her new kennel space. Acclimate your dog slowly to the new outdoor kennel by using it for just an hour or so at a time and only when you are home at first. Gradually increase the time spent in the kennel and vary the time of day more (this is especially important if you are transitioning your dog to outdoor living on a permanent basis). There is certainly no one single “right” or “best” outdoor dog kennel on the pet market today. But there are a great number of really fabulous pre-fab dog kennels and accessories that you can choose from to create an outdoor play area that will best reflect your pooch’s personality and needs. Finally, if you are on a limited budget, just start with the basics. Install the side panels first (choosing panels that are at least 6 feet high for all but smaller dogs). Add in some favorite bedding, toys and a water station and be sure the area also offers partial shade. Acclimate your dog to this simple structure in stages. Then, when you are able, you can consider creating a more permanent structure complete with temperature control, flooring, roofing, a doghouse, lighting, and security. In this slow and steady way, you can create an outdoor kennel your dog will love!